Mike drives a 2011 Dodge RAM 1500 QC to get around town and lug around heavy cargo. Once in a while, he’ll go out on nighttime adventures where he’ll need all the light he can get to safely traverse the road (or off it) ahead. Mike came to us to help him add powerful LED lighting in front of his RAM 1500. For him, we suggested the 42″ 240W curved LED light bar. 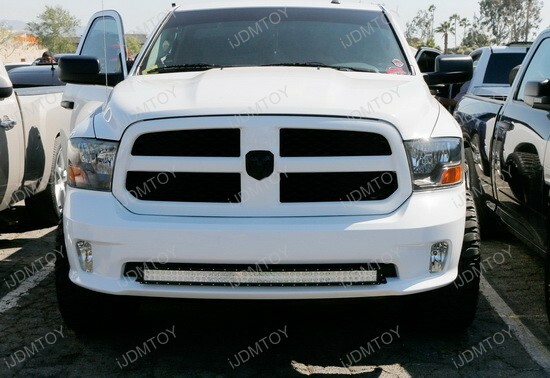 While the 42″ double row LED light bar fits the RAM 1500 Express with sport bumper perfectly, it is also a seamless fit on Mike’s lower bumper opening which gives his RAM’s front end an aggressive look while the LED light bar is off, and makes it a super bright source of light when the LED light bar is on. 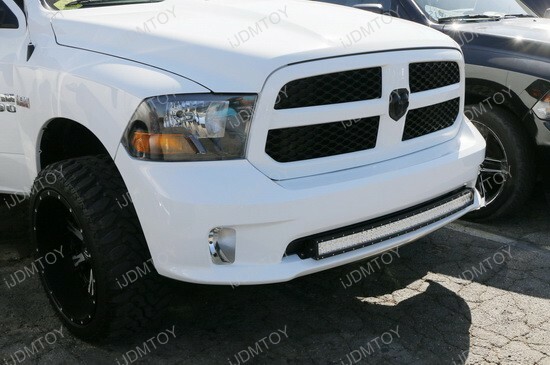 To install the double row curved LED light bar on his RAM 1500, Mike had to first remove the plastic grille piece from his lower bumper opening. He pre-assembled the light bar mounting brackets and secured them onto a nearby bolting location. From there, he was able to choose how far out he wanted his LED light bar to stick out by mounting it by the 1st or 2nd hole on the L-shaped metal mounting brackets. Once he finished the mounting, he wired his 42″ curved LED light bar using the included relay wiring harness, tested its power, and he was off to the races. “Great product and fairly easy to install.” We’re glad you had a streamlined installation process Mike! As you can see, Mike’s Dodge RAM 1500 looks fuller, more complete. It certainly makes for a formidable show truck, despite it not being decked out in more LED lighting than just the LED light bar. 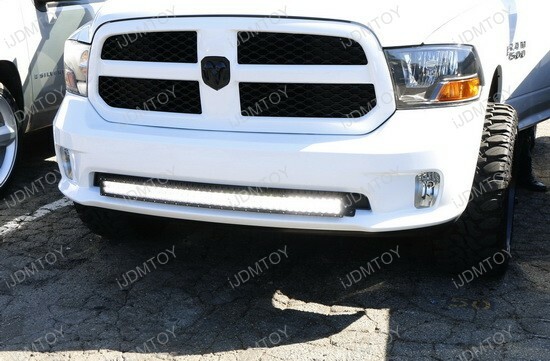 But with a singular LED light bar, Mike achieves a clean, utilitarian appearance so his Dodge RAM does not look gaudy. 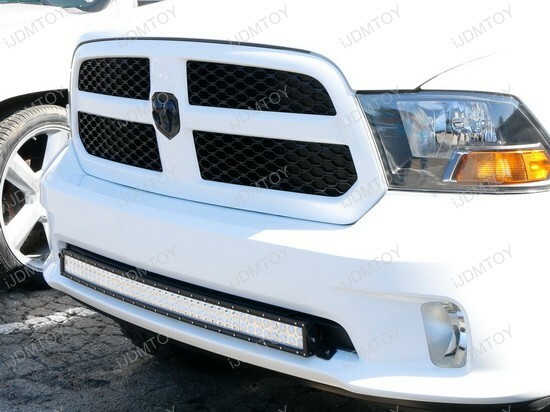 A light bar that features two rows of LED diodes and has a curved body is probably the complete package that most people look for. 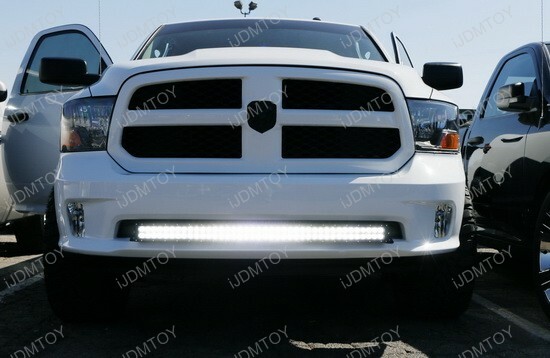 If that sounds like you, you can get an LED light bar like Mike’s by shopping for truck LED lighting at store.iJDMTOY.com! This entry was posted in - LED & HID Updates, Dodge and tagged 1500, 240W, 42", 4x4, aftermarket, dodge, dodge ram, double row, high power led, iJDMTOY, Installation, LED light bar, mounting brackets, offroad, pickup truck, Ram, RAM 1500, Trucks by Jason T. Bookmark the permalink.